The "best performers of 2008" (already?) are up in a list at BusinessWeek Online. Despite what many (including BW) would call a recession, there were some healthy net incomes. Their interactive chart (sortable) is kind of fun; but in an interesting discrepancy, the sector identified for each company does not agree with their print mag's reporting, and this makes me a little suspicious of their rankings which were tied closely to sector identity. Apple (#6 this year) is called a hardware company in print, but IT online. Handbag maker Coach is #1. Multiple good years for them. But skipping to the technology companies: Apple at 6, Cognizant Technology Solutions (an outsourcing consulting firm) at 19, Amazon at 23, Autodesk at 28, Google slipped to 34, and Microsoft is at 41. In companies not run by a white man in his mid-50's who looks distinguished and politiciany, we have just 2 women, at Avon (a company that got written up as having a "makeover" and looking "pretty") with Andrea Jung, and PepsiCo with the fantastic Indra Nooyi (Indian woman). I don't drink Pepsi because of her, but I like it better because of her. How about that Autodesk, a company alma mater of mine! (Adobe wasn't there this year, but was last year on the strength of the CS3 release.) The writeup is especially interesting if you were there at Autodesk working on this area: "Autodesk's latest software makes architects and engineers more productive-- and injects visual oomph into their designs. Its new three-dimensional software, including Revit Architecture, lets architects model a building's face and sides in the same drawing. Even midprice PCs can run the programs, and that has expanded the [company's] market." Autodesk had Revit (a local Boston-area acquisition) for many years, so it's hardly new. Midprice PC's are pretty peppy nowadays, so that claim may be true. 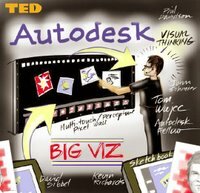 For all the old-boy cronyism and management nastiness I thought it had, Autodesk does have a smashing smart CEO who cares personally about product design and usability, and now employs some of the best interface designers I've ever worked with (particularly from the Alias acquisition). Top 50 history: The BW Top 50 from 2006 (Apple at #1), and from 2007 here (Google at #1).